James Henslin shares the excitement of sociology with his acclaimed down-to-earth approach and personal writing style. Sociology: A Down-to-Earth Approach, 12/e highlights the sociology of everyday life and its relevance to students’ lives. Six central themes help students stimulate their sociological imagination: down-to-earth sociology, globalization, cultural diversity, critical thinking, the new technology, and the influence of the mass media on our lives. MySocLab is an integral part of the Henslin program. Engaging activities and assessments provide a teaching and learning system that helps students discover sociology in their lives. With MySocLab, students can watch videos on sociological core concepts, explore real-world sociology through the new Social Explorer, and develop critical thinking skills through writing. Personalizes Learning with MySocLab: MySocLab is an online homework, tutorial, and assessment program. It helps students prepare for class and instructor gauge individual and class performance. Connects with Students: The author’s writing style permeates the vignettes, boxes, stories of personal experience, and examples of field research in the book. Encourages Understanding of Diversity: Students will gain an understanding of how social life is “done” in other parts of the world as well as examine groups that make up the fascinating array of people who form the U.S. population. 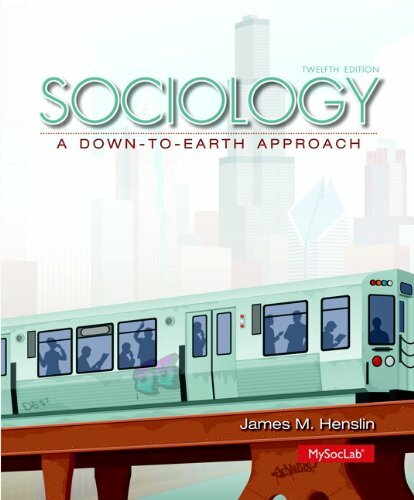 Sociology: A Down-to-Earth Approach, Twelfth Edition is also available via REVEL™, an immersive learning experience designed for the way today’s students read, think, and learn.